The Florida Supreme Court on Friday canceled oral arguments in a case challenging the state’s use of a new three-drug cocktail in executions. The court issued a terse, one-sentence order calling off a hearing scheduled for Wednesday on the issue. It wasn’t immediately clear what the ruling meant, though it did signal the court was likely to issue a decision based on written briefs. Convicted murderer Askari Abdullah Muhammad, who was set to die Dec. 3, won a temporary reprieve from the justices last month. Muhammad’s attorneys have argued that William Frederick Happ, who was executed in October using the new drug mix, was conscious for an unusually long time while being put to death and moved his head — showing that Muhammad might experience pain while being executed if the new combination is used. Happ was executed using a combination of chemicals including midazolam hydrochloride — instead of the previously used pentobarbital sodium — as part of the cocktail. The drug, the first of three injections, renders the inmate unconscious. But Bradford County Circuit Judge Phyllis Rosier, tasked with holding a hearing on the drugs, ruled that there was no evidence that the use of midazolam hydrochloride would violate the constitutional ban on cruel and unusual punishment. 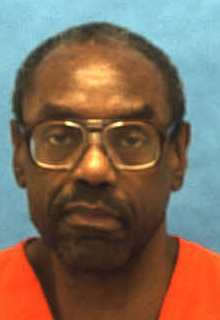 Muhammad, 62, was slated to be executed for stabbing corrections Officer Richard James Burke to death with a sharpened spoon in October 1980, while Muhammad was already on Death Row. Muhammad, who was known at the time as Thomas Knight, was initially convicted of kidnapping and killing Sydney and Lillian Gans in 1974. He also escaped from the Dade County Jail while awaiting trial and was involved in a liquor store robbery in Cordele, Ga., where two clerks were shot, with one killed. Interesting he is to be executed for his second murder conviction rather than his first one. This way, the first two murders are just freebies. The other way, the killing of the guard would be a freebie. If anyone wanted to be sure they killed him painlessly, put him in an air-tight chamber and replace the air with nitrogen. Not even a pinprick of pain, no organs damaged other than the brain and it doesn’t seem all that fit anyway. Maybe he’d agree to death by sharpened spoon? He murders multiple people and now he’s worried about “cruel and unusual punishment?’ Makes sense. Thomas Knight should not be breathing out air anymore. After the pain and destruction this man has caused I wish nothing more than some pain during his execution. We don’t want a convicted murder to experience pain…let’s ask this question: did the victim experience pain when he killed them? Just a thought. who cares if he feels pain! there was no compassion for his victims. I say bring back the noose, it works every time. Using a noose correctly breaks the neck and the person being hanged loses consciousness within seconds. I can’t believe we coddle these killers.